umm. have you seen the mario toys all around my apartment? I put them in the medicine cabinet in the bathroom. And next to the dishes in the kitchen cabinet. And standing on every door ledge. But, if you must appear grown up, I think the best mix is the new wave of art based on fun characters. 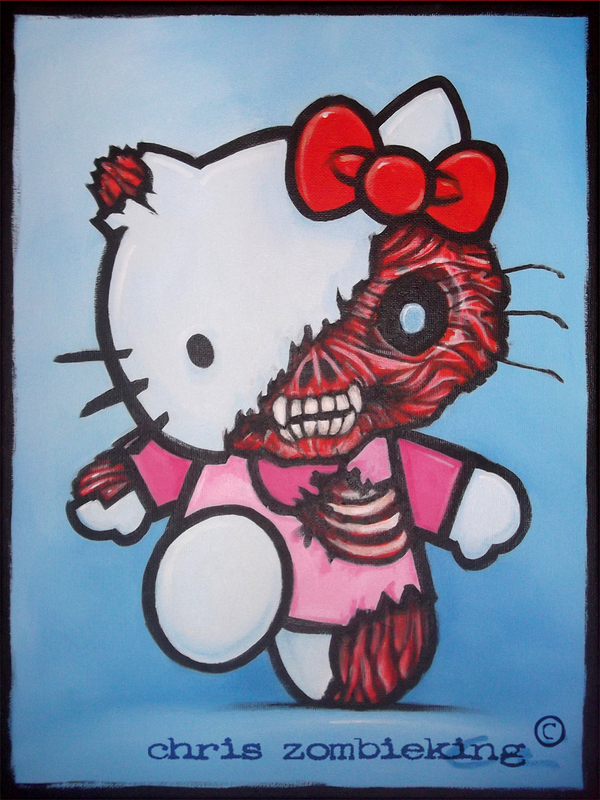 So, go find tasteful hello kitty artwork, and get someone in vietnam to recreate and ship it for $50. Hur Hur Hur! We have a theme for our art work at home. In the hall the theme is maps. So we’re going to have all sorts of ‘adult maps’. Also it just dawned on me that adult has a different connotation in the world of the internet! There is no such thing has tasteful hello kitty artwork only cutesy real hello kitty, crazily expensive made in Japan hello kitty and fake wannabe china hello kitty. Also mike, you DO NOT count for the average American! Your friends do not call you CM for no reason! I think you are right about the “death of cuteness” in the US. While I appreciate a childish sense of whimsy and fun, I have to say personally that “cute” things – especially cute things that are for sale or selling something – just grate on my nerves. (Asian sensibility, like Hello Kitty, especially tends to run even further toward “ultra cute” than I can bear.) For example, I think a big-eyed floppy-eared puppy running around a yard is cute in an adorable, happy way. The same puppy used in a commercial or advertisement turns me off. I think for me there is a sense that I am being manipulated as a consumer by the producer of the good. Like, “you MUST buy this thing (for yourself or your kid) because LOOK HOW CUTE IT IS, with such big eyes and saccharin sweet colors.” Being around such things don’t make me happy; they make me feel shallow, conformist, and used. Maybe we Americans just already get all the “saccharin” we need from our Disney indoctrination and our oversized desserts! And in the US, it is not generally acceptable for straight men to like or even tolerate cute, girly stuff, so don’t blame Kris for being a normal American guy. I would really worry about him if he DIDN’T protest the Hello Kitty bedsheets, haha. I get what you mean about being manipulated by the sellers. I feel the same way about branded stuff, buying them (no offence to anybody owning it, its a free country!) makes me feel like I have been sucked into this black hole of, ‘If you don’t buy them, you’re not as classy as the person beside you.’ Which ironically makes you unclassy/uncool/(insert suitable adjective) because if you need a bag to prove a point, you probably overcompensating for something more significant. Plenty of people save like mad in sg to buy a LV, I mean our mean income is 3200SGD, there is no way so many people can afford a bag for 4000SGD. Interestingly more people hold a LV/Gucci bag that the folks along Wall Street. I actually stood there for 45minutes the other day just to observe people.